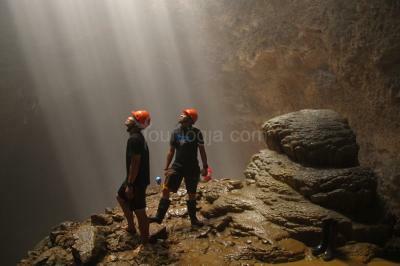 Jomblang Cave is one of a most fantastic caving tour activity for adventure lovers that the one of the most things to do in Yogyakarta. The cave located at Semanu, Gunung Kidul regency means being just an hour away (at least) from the beautiful beach at south java sea. 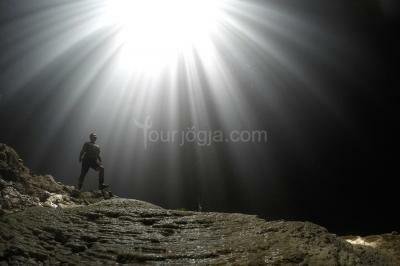 Jomblang Cave Adventure is an amazing tour caving activity into the vertical cave that connected with other vertical cave named Grubug Cave, a place where you can see light from heaven. Then after the caving, the trip will continue to visit gunung kidul beach to enjoy beautiful white sand beach or pump your adrenaline with cable cart (gondola ride) at Timang beach. 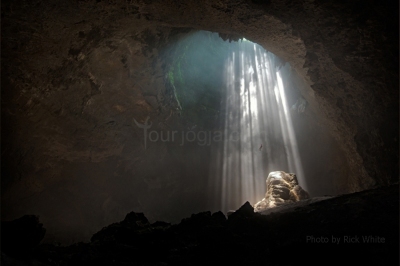 After reach the bottom of Jomblang then continue the journey by tracing the tunnel with its beautiful natural ornament to connecting the Jomblang cave with other vertical cave named Grubug Cave, a place where you can see light from heaven. There is some beach you can visited and offers you some beach activity or just sightseeing. You can enjoy beautiful white sand beach or pump your adrenaline with cable cart (gondola ride) at Timang beach. You can decide and pay itself directly on spot for the beach activity. About special request to Timang beach, there is additional local shuttle transport (jeep rent) from the car parking area to visit Timang beach as the cable cart location and you can pay itself directly on the spot.